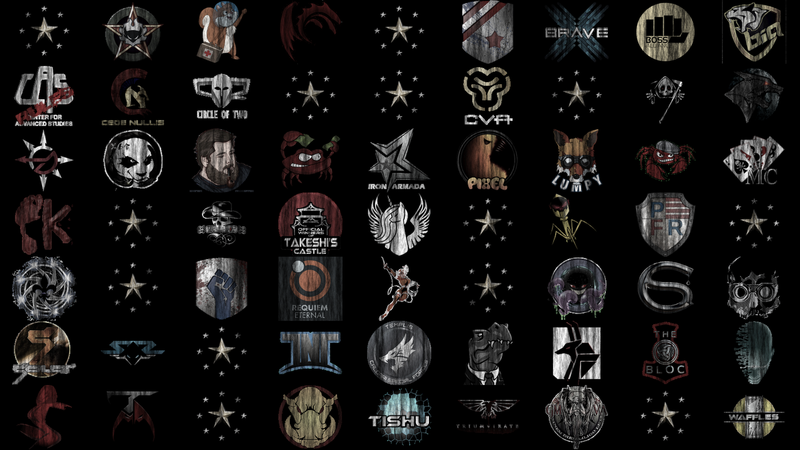 Under the guise of Apothne and Ashley Traynor we’ve now reached the grand finale of our tour of AT Teams participating in AT XIV (seriously CCP, start using numbers). In this last part we’re touching on some hardhitters: The Tuskers Co., The-Culture, Triumvirate., Villore Accords, VYDRA RELOLDED, WAFFLES., WE FORM V0LTA and White Legion. ATXII: Beat Cynosural Field Theory, beat The Initiative., beat Feign Disorder, beat Exodus., lost to The Camel Empire, beat The R0NIN, and were eliminated by Nulli Secunda. Last year The Tuskers came extraordinarily close to beating the Warlords of the Deep (HYDRA) famous mobile-tinker setup in an incredible match, taking out their support but not being able to make any headway on that heavy core, before getting hit by some jam cycles from the Warlord Widows. This is also an excellent display of logistics piloting while under extreme ECM pressure by Latronicus. Formed as a split-off of the EU part of Black Legion, The-Culture immediately asserted themselves as a player in the sov-null scene and currently holding a large part of Fountain and some of Cloud Ring. Black Legion never had a particularly strong tourney team so we’ll have to see what The-Culture can put together! Triumvirate are a phoenix among Alliances, dying down and rising again year on year. As of now, they’ve been at war for the past one and a half years and have often stood tall amongst the likes of NC. and PL in terms of ability. On the sov side of things they currently hold 82 systems in and around the Insmother and similar regions. ATXII: Lost to HYDRA RELOADED, beat R.E.V.O.L.U.T.I.O.N, beat Surely You’re Joking, beat Agony Empire, beat The Gorgon Empire, beat Outbreak, beat Tactical Narcotics Team and were eliminated by The Afterlife. ATXIII: Beat Dream Fleet, beat M.I.F, beat The Afterlife., lost to Warlords of the Deep and were eliminated by Hard Knocks. Since last year Tri have lost their core AT team to form WE FORM VOLTA, meaning they are likely to struggle to achieve the excellent results we have come to expect from them as an alliance. Villore Accords are a Gallente Militia Faction Warfare group based over in the Black Rise/Placid regions. Based on killboards alone, they’re big fans of small-gang warfare and hold a tight grip over their warzone territory. GMVA is perhaps best known as the former home of CZ chief editor and Machariel fanboy fetishist, Niden. Yes, that is the correct spelling. Home of renowned PvP’ers Lussy Lou and NOisER, this remake of the old Hydra Reloaded certainly shows some promise this year in ATXIV. Even without huge numbers Vydra hit hard and fast whether it be in a group or flying solo. Expect to see flashy piloting if you meet them in the flesh. Regarding VYDRAs skill this year, I don’t think it’s a question as to whether or not they’ll be good, but how good? Will they be another Camel Empire? Will they be the gatekeepers to the final weekend like The R0NIN or The Afterlife.? Will they be a solid mid-tier team like TEST or Agony? We’ll soon find out. First Match: The Tuskers Co.
Waffles, originally a feeder corp for Sniggerdly, the founding (and best) corp in Pandemic Legion have undergone a rebranding in the past year to WAFLLES 2.0, flying much heavier doctrines and engaging in capital warfare to a degree not seen in Waffles for years. In previous ATs, Waffles garnered a reputation for bringing the perfect counter comp to what they faced but then losing anyway. Hopefully their focus on gaining strength and moving away from being a feeder corp will have helped slow the brain-drain of experienced pilots to PL, allowing them a greater pool of talent and SP this year for the tournament. In the words of StarFleetCommander himself, “We are Eve Terrorists, We Attack everyone and anyone in K-space”. V0LTA are a part of the Therabois who typically spend their time roaming k-space and “ruining Suitonia’s gameplay”. Based on their killboard stats alone, they’re a formidable opponent to anyone looking to roam nearby Thera, especially given the skills these boys bring to the table with the support of strong pilots such as Tikktokk Tokkzikk. Previously the core of the very strong Tri. team, VOLTA are undoubtedly going to be one of the top teams this year and have a damn fine shot at making the top 3. They are also one of the teams you can expect to have no issue fielding uniques. The remnants of Elo’s reformation of Black Legion as White Legion and current home to the corp-hopping CSM member Gorski Car, White Legion is a French AT team who have shown some promise in the open practices. We’ll have to see how that actually pans out in their matches since they pulled a hard first match in Northern Coalition.